I recently got an ft explorer, and have been prepping it for some medium-range fpv. I am using the c-pack motor with a plush tenergy 60 amp esc. I was wondering if it would be able to fly with a multistar 4s 10,000mah battery(800 grams). I have increased the wing-span to 6 feet and have extended the tail section. I also moved the wing back a couple inches to center the CG. I have measured and the battery would be able to fit in the fuselage, and with room to movement it around to balance the CG, although this will not be a problem as the CG is balanced with only a 2200mah 3cell inside. Would it be able to fly with the larger battery, or would it be too heavy? That sounds like an interesting setup. I have a modded Explorer too. Very stable plane. One way to make a good guess as to whether it will fly would be to weigh the entire plane, with all the gear in it. If you don't have the battery yet, just get a bunch of bolts or something in there (weigh them so you get 800 grams total) to simulate the battery weight. Then, figure out how many watts your setup will be doing. 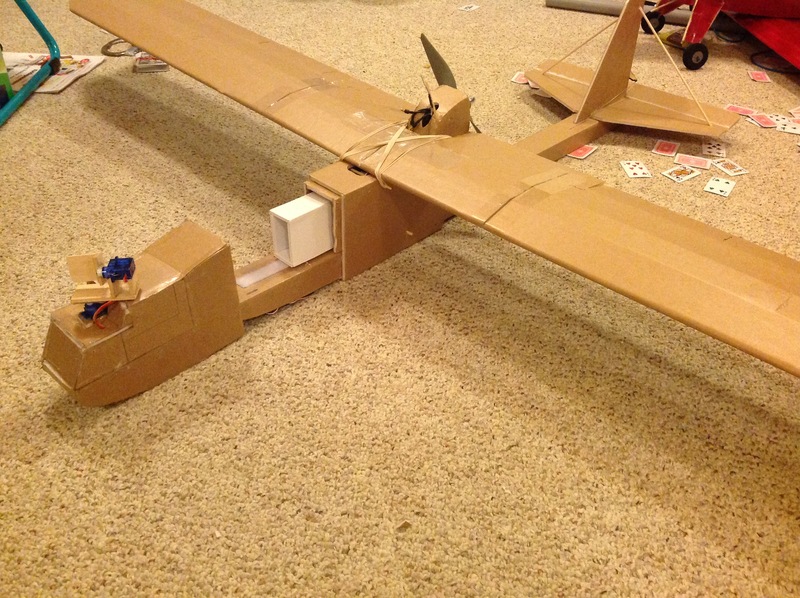 A plane should have roughly 50-80 watts per pound (WPP) to fly well, but not acrobatically. Watts (in case you don't know) is volts (V or sometimes E) times current in amps (I or sometimes A). So just take your 4s battery (14.6 V) and multiply that by your motors peak amp draw (Since you are using a 60amp esc it will probably be close to 60 Amps). Then, divide the number of watts by the weight of the plane in pounds. (On your setup I think it will be about 700-750ish watts). Here is a picture of the explorer, the white foam board box is a model I made of the battery using the dimensions found online. Toss it in the air and give it a shot. I'm relatively new to flying rc and built a storch that were too heavy to fly well but they glided nice so no crash. Just ensure that the wing joints can take the extra load to about 5 Gs minimum or it might just fold in mid flight if you are forced to maneuver suddenly. i have flown my ft explorer with a heavier foam board than dollar tree with two 2200mah batteries, which weighed 400g altogether and that flew wonderfully. the AUW was 1400g and it could still glide well. but i did have to put a arrow shaft in the wing to stiffen it up abit.